Connect with More Diners and Patrons – Restaurant and Food Service Solutions | ASTRALCOM - Content Strategy, Conversion Marketing and Customer Acquisition. 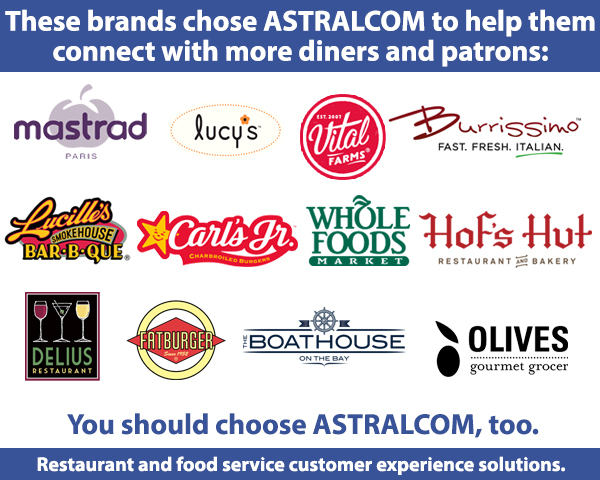 Connect with More Diners and Patrons – Restaurant and Food Service Solutions | ASTRALCOM – Content Strategy, Conversion Marketing and Customer Acquisition. Attract, Engage and Convert More Diners and Patrons. Connect with more diner and patrons across more channels and sell more. From printed collateral materials, signage and banners, to web design, search advertising, social media and content marketing – we’ve got the perfect solution for you to connect with, engage and convert more visitors into diners and patrons. Learn more about our restaurant and food service marketing and customer experience solutions at this link. If you want to grow your food-related business, we’d love to talk with you! Contact us and let’s discuss your ideas.